In a large bowl, combine the flour, sugar, baking powder, salt, ginger and orange zest. Whisk until fully incorporated. In another smaller bowl, lightly beat the egg with the milk. Pour egg mixture into the dry ingredients and mix until just combined. In the meantime, add the butter to a 10-inch cast iron skillet and place in the oven to melt. Once melted, remove pan from the oven and pour the batter into the pan. Without stirring the batter into the butter, lightly push the mix into the corners of the pan with the back of a spoon. A little butter may pour over onto the batter, which is fine. Place back into the oven to bake 25 to 30 minutes, or until golden brown on top and cooked through. Serve sliced cobbler topped with fresh fruit, mint, pepitas and Greek yogurt. Ya know, I don't normally lean towards cakey types of breakfastseses. But holy mother of cobblertown, things done diddly done changed, yo. The inspiration for this here Breakfast Fruit Cobbler recipe comes from Tara over at the stunning blog Seven Spoons. I ADORE using my cast iron skillet any way I can (would you believe it's not just for banging burglars and criminals over the head? 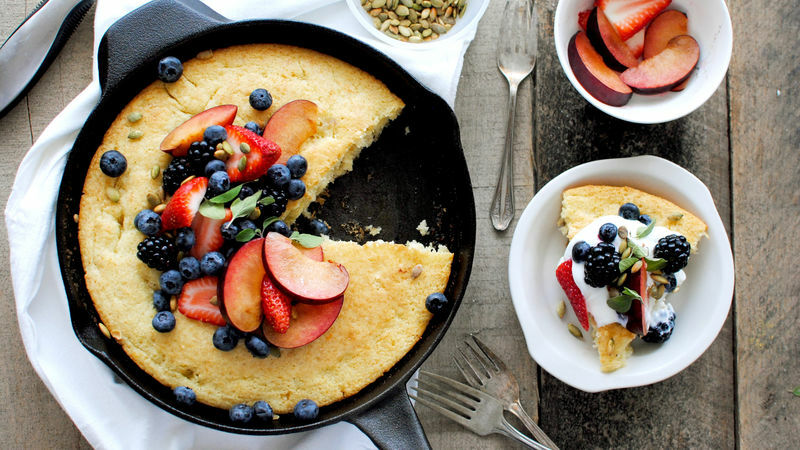 ), so when I saw her incorporate cobblery bread and fruits and yogurt and all that, I was like, whaaaaat. And then I made it. I willy nillied a tad here and there, keeping the fruit as a fresh topping, and opting for all-purpose flour all the way through, but I kept the SPIRIT the same. I don't know why I just put the word spirit in all caps. Grab some flour, sugar, milk, an egg, butter, fruit (whatever makes you sing), baking powder, crystallized ginger, orange zest, and salt. Not necessarily in that order. In a bowl, whisk together the flour, sugar, baking powder, salt, crystallized ginger, and zest. After! Wasn't that so exciting? Then you'll whisk in the egg and milk until it's all smoooooooth. In the meantime, drop the butter in your cast iron and stick it in the hot oven to melt. Once it's melted, pour the mixture in and spread it across the pan. Don't mix it with the butter, just spread it all around. Then you bake it for about 25 minutes and this is what.yew.gert. Oh my gosh. All that fruit. I can't even. Slice and serve it with Greek yogurt and fresh mint and toasted pepitas uuuuuuugh. Can you even think straight right now? I mean, I know. That's cobblered, not clobbered. Thank you very much. For more musings, visit her blog Bev Cooks and her Tablespoon profile.